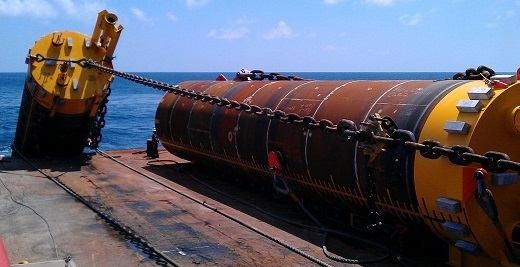 InterMoor, an Acteon company, has successfully installed and hooked up a permanent mooring system for the Delta House field floating production system (FPS) in the Gulf of Mexico. The mooring lines were deployed and installed on time and without incident, despite the challenging circumstances. Project developer LLOG Bluewater, a joint venture between LLOG Exploration and Blackstone Energy Partners and its affiliates, contracted InterMoor to design, fabricate and install 12 suction pile anchors; to install 12 preset chain/polyester mooring lines; and to hook up the FPS in 4400 ft of water in Mississippi Canyon Block 254, 130 miles southeast of New Orleans. InterMoor fabricated the suction piles at its 34-acre facility in Morgan City, Louisiana, USA. The piles, which were used as permanent anchors for the project, are 85 ft long, 16 ft in diameter and weigh approximately 150 metric tonnes. Installation was in Q2 this year and was followed by the hook-up in Q3. One of the challenges of this deepwater installation was the use of a prescribed anchor-handling vessel, the Joshua Chouest, on long term charter to the LLOG drilling department. Because the mooring system was procured early on in the design process, it was necessary to find a solution that would utilize the selected vessel and extend the vessel capabilities beyond what has previously been done with this class of vessel in terms of mooring component size. “Fixing two elements, the vessel and the mooring components, in the design, independently of one another, was challenging. However, working closely with the suppliers and manufacturers in an iterative process meant that we could ensure equipment was optimized for the application and the project was successful. “As permanent mooring systems get larger and larger, utilizing traditional anchor-handling vessels for the installation is proving more and more challenging. Flexibility, adaptability and innovation are critical to extending the capabilities of the existing fleet of anchor-handling vessels to keep pace with larger mooring components, to maximize returns and deliver projects on time and within budget constraints,” he added. The Delta House mooring system was deployed and installed safely and on time, without incident. The hook-up system was successfully connected under high loads, with close attention to tolerances and connection interfaces. Technical innovations stretched the capabilities of the designated anchor handling vessel, minimized twist in the mooring, and ensured cost-effectiveness that would not have been possible with another vessel. The FPS is designed for a peak capacity of 100,000 bbl./d of oil and 240 Mcf/d of gas. First production from the facility is expected in the first half of 2015.